If you have the eyes of love, you see love wherever you go. The trees are made with love. The animals are made with love. Everything is made with love. When you perceive with the eyes of love, you see God everywhere. Wearing Zara Blazer, Victorias Secret tee, Topshop jeans, Michael Kors wedges, Topshop bird earrings(Love), UO turquoise necklace, and Karen walker sunglasses. I love the blazer and necklace sooo much! Amazing post!! Wow, really.. really nice. I love the contrast of that blazer with that necklace. Those shoes are fab, they definitely deserve their own spot light. love the colors you combined Delmy :) This is a great post and outfit! Nice shades. I always like tortoise shell. Really lovely Delmy! Adore you! damn girl, you have gorgeous hair. I love the colour and the body and waves, it's so effortless. Also love your sense of style, this is such a chic and well put together outfit. And am totally in love with your MK wedges, they are amazing. Awww looking beautiful as always! u look great.. everything fits so well..
Like the new look of the blog, is this going to be permanent now? love love love your style!! as stated above soo chic and effortless. topshop earings are gorge! the blog looks great in black, makes the photos pop out more. the blazer and jewellery is gorgeous. What a fabulous outfit Delmy. You alway put the best ensembles together. :) Those sunnies are so fun! Happy day to you sweetie. HUGS. You look so so so so pretty!! This look is perfection, I adore the combination of tones and the wedges....Amazing! I love your sunglasses! you have fantastic style btw, so ladylike and chic, but very still very contemporary. Love your blazer's colour and the wedges... I like these colours put together! Wedges are dupe and the colors go so well together.. This is beautiful! 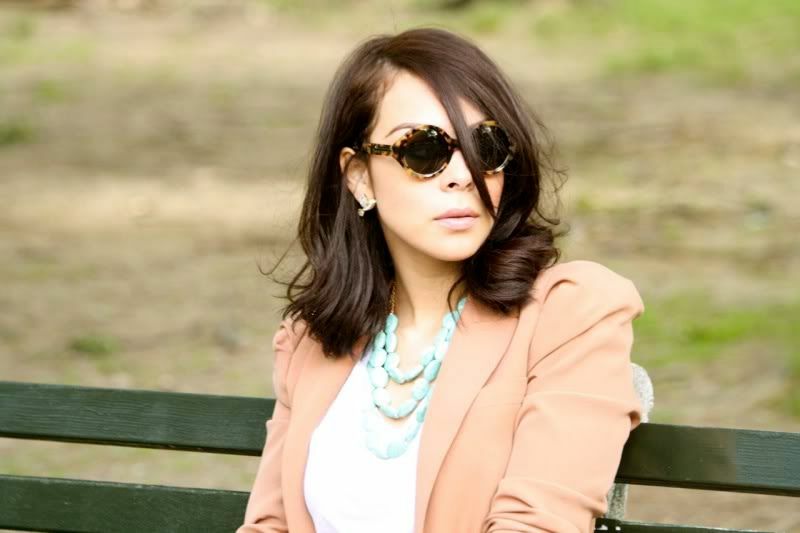 Love your blazer and sunglasses! So cute and cool and perfect!!! And the little bird earings are amazingly cute!!! You look great!!! I love your blazer!! Beautiful blazer. wow was surprised by this dark layout, but actually I've been thinking of them too. But I think it's a bit "scary", white is also good for photos.. But everybody need a change sometimes! <3 the blazer & wedges! stunning! love the blazer! i saw it and liked it but had shopped too much! i feel like getting it after all! I really love this outfit!! The shoes and earrings are my fav, but everything about this oufit is CUTE!!! Beautiful colors! LOVE The wedges and the sunglasses. love it! zara has the best blazers! it's the one clothing item that i can't have enough of. Ahh i LOVE EVERYTHING about this outfit!! You look soo pretty! Drooling over your sunnies + blazer + wedges!!!! p.s hope you're okay, I read your tweets about the boy. Hang in there boo, youre beautiful, his loss! I love the Karen Walker's! Love it !!!!!!!!! i love this outfit !!!!! amazing shoes !! You look lovely! I adore your sunglasses!! I need that blazer in my life!! Very elegant. I love the blazer. love that blazer, and I love love! I`m completely in love with your wedges! Awesome sunglasses! Love the color combination, esp that blazer and necklace! Great blazer. Amazing necklace. Love the colors! i like so much your blazer and the earrings! great blazer and the look is perfect!!! I discovered your blog, and i love it! I have the same Zara blazer, you wear it very good! I absolutely LOVE your sunglasses! I'v been trying to find a pair like that. and the wedges are lovely! I love your outfit!!!! The earrings are adorable, and the shoes are amazing! 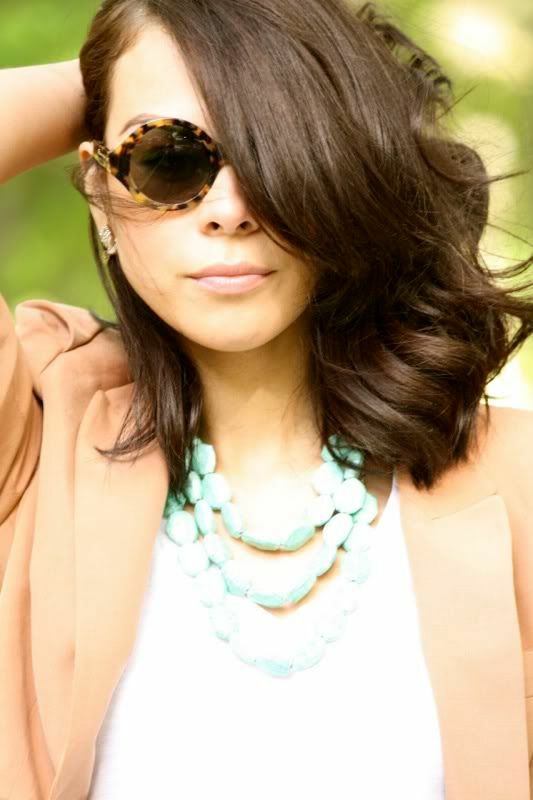 I love Love!...gorgeous top to bottom, love the sunnies! Perfect outfit! I love every single piece (the pink blazer, the brown wedges, the necklace,...) and the way you put them all together! This outfit is just beautiful and really stresses your beauty :-))Love the shoes! oooooooooooooooohhh girl, i looooove this!!! you look gorg. love how well this outfit is put together! I love love love this outfit. If flawess! I wish I had an eye for outfits like you do. So stylish. and so is this outfit! I love the turquoise necklace! I've been searching for one for a long time. Where did you buy this one?